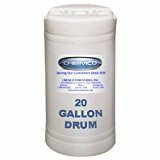 Industrial Degreasers - Tarvasol By Chemco - Industrial Strength Degreaser - 20 Gallon Drum - Natural blend of D-Lemonine and petroleum distillates removes heavy build-up of tar, asphalt, grease and oil from trucks, automobiles, oilers, truck beds, shovels, roofing equipments and fabrics. It may be used as is or diluted with Kerosene, water or mineral spirits. Tarvasol contains special wetting and emulsifying agents as well as D-Lemonine so that after the tar, asphalt and grease has been dissolved; the mixture can be washed away completely with water to give a clean streak free surface. Recommended for removal of road films, grease, oil, asphalt, roofing tar and road tar from trucks, industrial equipment, machinery, automobiles, school buses, road primer tanks and auxiliary tanks. Earth Friendly - Green Product - Biodegradable.